The Bank for International Settlements (BIS) started in 1930, and it is owned by the central banksEuropean Central BankThe European Central Bank (ECB) is the central bank for all the European Union (EU) member states. The body has the responsibility to the euro... of different countries. It serves as a bank for member central banks, and its role is to foster international monetary, financial stabilityQuantitative EasingQuantitative easing (printing money) is used by the central bank to alleviate economic underperformance and keep the economy from falling into recession and financial corporation. The Bank for International Settlements is based in Basel, Switzerland, and it operates representative offices in Hong Kong and Mexico City. The Bank of International Settlement was established out of the Hague Agreement of 1930, among Germany, Belgium, Italy, France, the United Kingdom, Japan, Switzerland and the United States. The BIS first opened its offices on May 17, 1930. Its main role was to collect, administrate and distribute reparations that were imposed on the German Government by the Treaty of Versailles after World War I. It also acted as the trustee of the Germany Young Loan, which was floated in 1930. The task of facilitating reparation payments became obsolete after the Hoover Moratorium of June 1931 suspended it, and later in July 1932, the Lausanne Agreement abolished the reparation payments. After its initial function was terminated, the BIS was then tasked with fostering cooperation between member central banks. It worked to provide banking facilities to central banks and conduct meeting forums where central bank governors would meet to deliberate. One of its initial activities as a bank for central banks was to help the continental European central banks in shipping part of their gold reserves to London and New York. After the outbreak of World War II, there were concerns about the continued operations of the bank. The members agreed that the bank would remain open and that no meetings of the board of directors would be held during the period of hostilities. The members also decided that the bank would remain neutral while conducting its business. However, as the war progressed, the BIS was seen as leaning towards the Germans, and there was increasing discomfort from the UK and US. During the Bretton Woods Conference in 1944, the members agreed to liquidate the bank at the earliest possible moment. The dissolution was supported by the American and European delegates but opposed by the British delegation. However, the dissolution was halted in 1945 by the new US government and the British government, and the decision to liquidate the BIS was terminated in 1948. According to the BIS Charter that was formally adopted on January 20, 1930, both individuals and central banks would subscribe to shares issued by the BIS. However, the charter limited the voting rights and representation at the BIS meetings to central banks of countries in which the shares were officially subscribed. In 2001, the BIS reviewed the share subscription rights and restricted the share ownershipCapital StructureCapital Structure refers to the amount of debt and/or equity employed by a firm to fund its operations and finance its assets. The structure is typically expressed as a debt-to-equity or debt-to-capital ratio. Debt and equity capital are used to fund a business’ operations, capital expenditures, acquisitions, to central banks or equivalent monetary authorities in its respective member countries. The individual shareholders were locked out of share ownership and compensated. 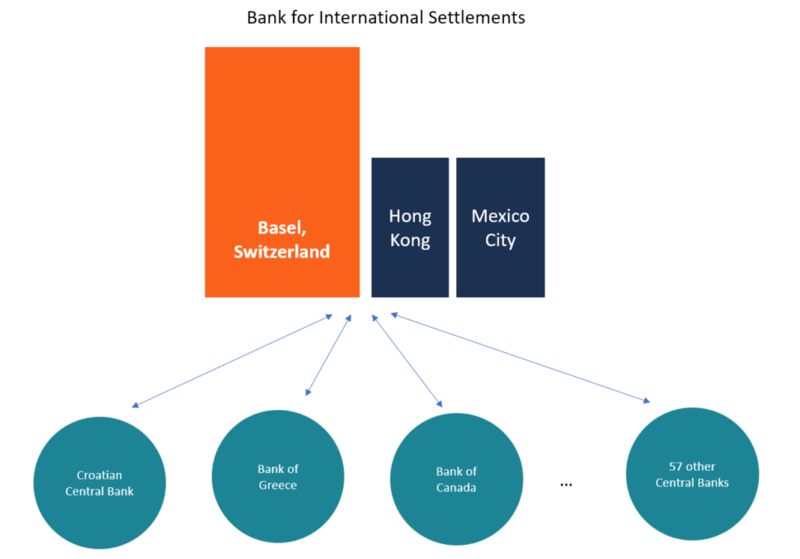 The Bank of International Settlements functions as a bank, and it competes with other international financial organizations for banking activities. It is clientele comprises central banks of its member countries, but it does not hold current accounts for individuals and governments. It offers premium services and high returns on invested funds as a way of attracting central banks. It maintains high levels of equity capital and reserves that are invested in various portfolios to earn returns for the institution. The BIS ensures the liquidity of its members by buying back tradable securities from the central banks. During the general meetings, all members are entitled to vote and be represented. The voting power is equivalent to the number of shares issued in the country of each member at the meetings. The most important meetings at the BIS are the regular meetings of governors and senior officials, which are held every two months. The meetings provide a platform for members to discuss the global economy, financial markets and other issues that are of interest to the central banks. The Annual General Meeting is held in late June or early July. The topics of discussions at this meeting include distribution of profits and dividends, approval of annual financial reports, approval of allowances paid to board members and selection of the BIS’s external auditors. Also, the bank may sometimes call for extraordinary general meetings when liquidating a bank, changing the equity capital or amending the BIS statutes. The Bank of International Settlements is presided over by three decision-making bodies, which include the general meetings of central banks, the board of directors and the management of the BIS. Decisions made at these levels are based on a weighted voting arrangement. These decisions are of administrative and financial nature, and they relate to banking operations, allocation of budgetary resources and internal policies. As a banker to central banks, the BIS provides a wide range of financial services to assist central banks and other monetary financial institution in the management of foreign reserves. When central banks want immediate liquidity, it offers credit services, as well as buys back tradable financial instrumentsMarketable SecuritiesMarketable securities are unrestricted short-term financial instruments that are issued either for equity securities or for debt securities of a publicly listed company. The issuing company creates these instruments for the express purpose of raising funds to further finance business activities and expansion. offered by these central banks. It also acts as a trustee in connection with international financial operations, which helps promote global financial and monetary stability. The BIS organizes workshops and seminars focused on international financial issues through the Financial Stability Institute (FSI). Through the FSI, the BIS popularizes the work undertaken by the Basel Committee on Banking Supervision, as well as its recommendations on the financial markets. FSI also organizes lectures and practical training on global financial stability. The meetings of central banks executives, specialists, economists, and supervisors contribute to international cooperation. The BIS publishes research and statistics on global banking, foreign exchange, financial market securities, and derivatives market. The information is shared across its member central banks to help in their functions and decision-making. The research is also published in the banks’ regular publications and external publications like academic journals. The research is conducted by the BIS’s staff, as well as researchers from its member central banks. US Federal ReserveFederal Reserve (the Fed)The Federal Reserve, more commonly referred to The Fed, is the central bank of the United States of America and is hence the supreme financial authority behind the world’s largest free market economy. Lender of Last ResortLender of Last ResortA lender of last resort is the provider of liquidity to financial institutions that are experiencing financial difficulties. In most developing and developed countries, the lender of last resort is the country’s central bank.